We used the Fire Strike Extreme benchmark and stress test in 3DMark for our temperature and power consumption tests respectively. The synthetic 3DMark benchmark tests graphics and computational performance at different resolutions, starting at 1080p and going all the way up to 4K. A series of two graphics test, one physics test, and then a combined test stress your hardware in turn to assess its performance. The Radeon VII came in somewhere between the GeForce RTX 2070 and 2080 in the Fire Strike benchmark, where it was just under 9 per cent quicker than the former card. However, in the 4K Fire Strike Ultra test, the Radeon VII inched ahead of the GeForce RTX 2080 by around 2 per cent. This is something that you'll see in real-world gaming benchmarks as well, and it seems like the Radeon VII is ever so slightly more competitive at ultra-demanding 4K resolutions, thanks to its massive super fast 16GB frame buffer. 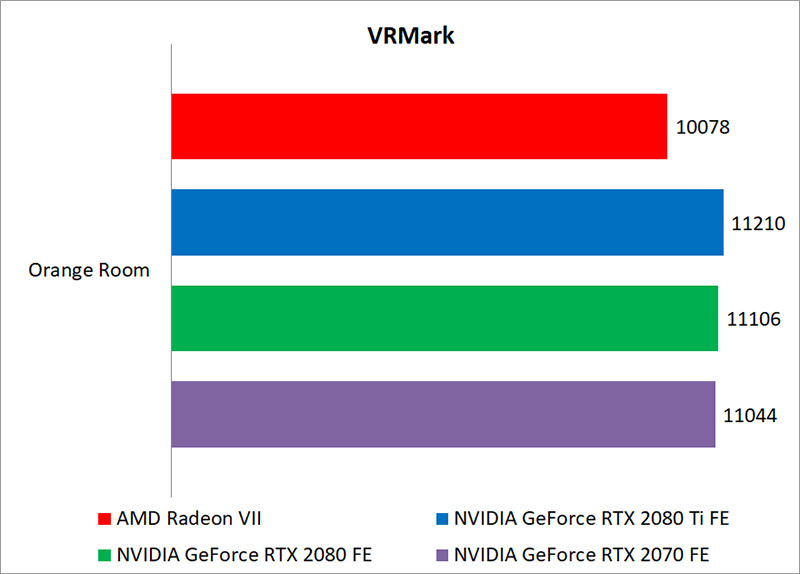 Futuremark’s VRMark benchmark is designed to assess a PC’s ability to handle high-performance headsets like the HTC Vive and Oculus Rift. If a PC passes the Orange Room test, it is ready for the latter two systems. 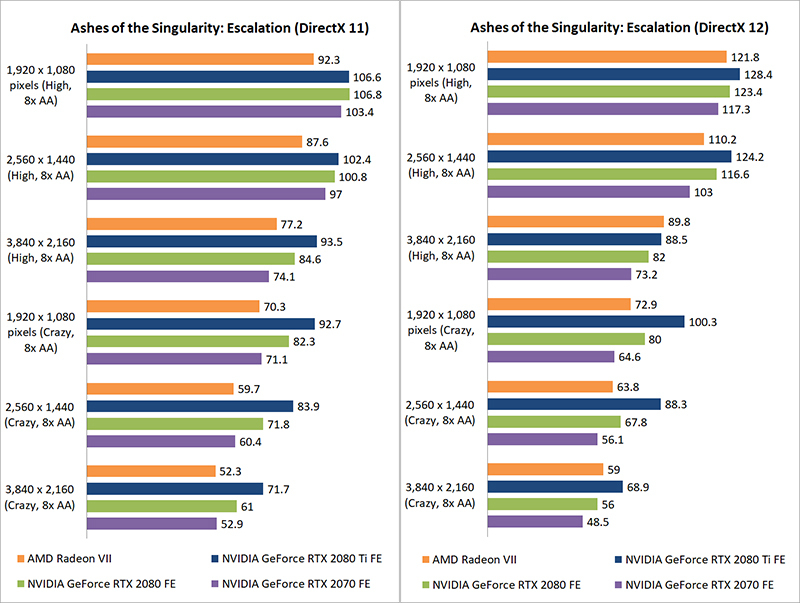 The second graph also shows how the cards fared against the benchmark's target of an average FPS of 109. The Radeon VII trailed all the NVIDIA cards, coming in around 9 per cent behind the GeForce RTX 2070. Ashes of the Singularity has long been the poster child for the performance benefits a low-level API like DirectX 12 can bring. It is based on the Nitrous engine and can be extremely punishing thanks to the huge number of onscreen units and the sheer level of detail accorded to each unit. However, the CPU does become the limiting factor at lower resolutions and settings. The results were sort of a mixed bag for the Radeon VII. 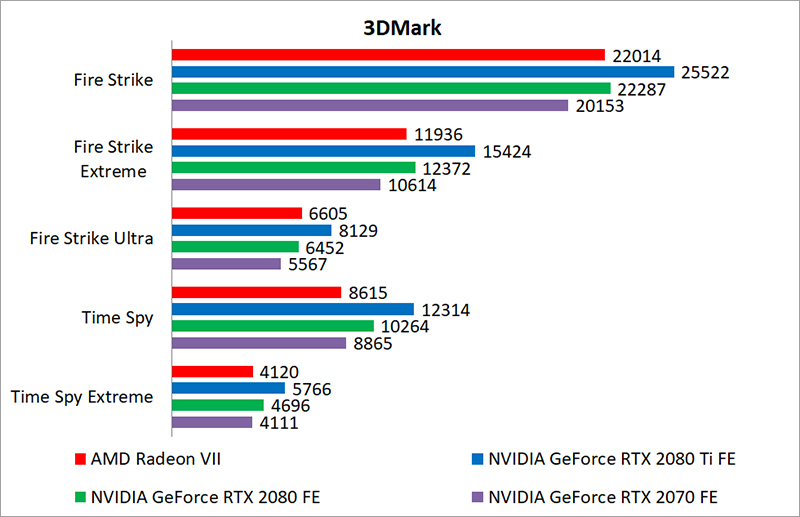 It trailed the GeForce RTX 2070 in most of the DirectX 11 benchmarks, but it proved quite capable at taking advantage of the shift to the low-level DirectX 12 API. 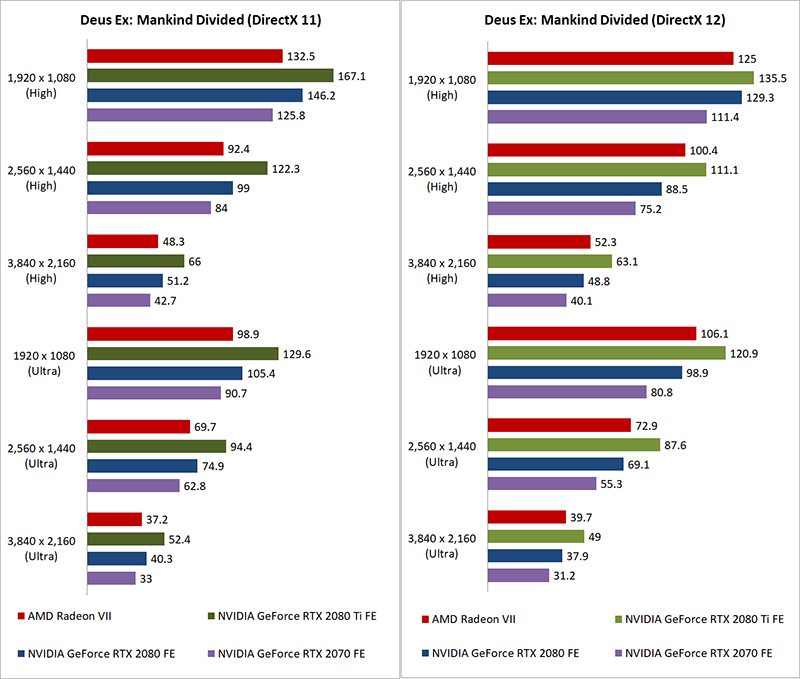 In the DirectX 12 benchmarks, it pulled ahead significantly and managed to close the gap with the NVIDIA cards. Mankind Divided features just about every trick to make your game look pretty, including things like volumetric and dynamic lighting, screenspace reflections, and cloth physics. Even though it was released in 2016, the game is capable of bringing even the most powerful systems to their knees. 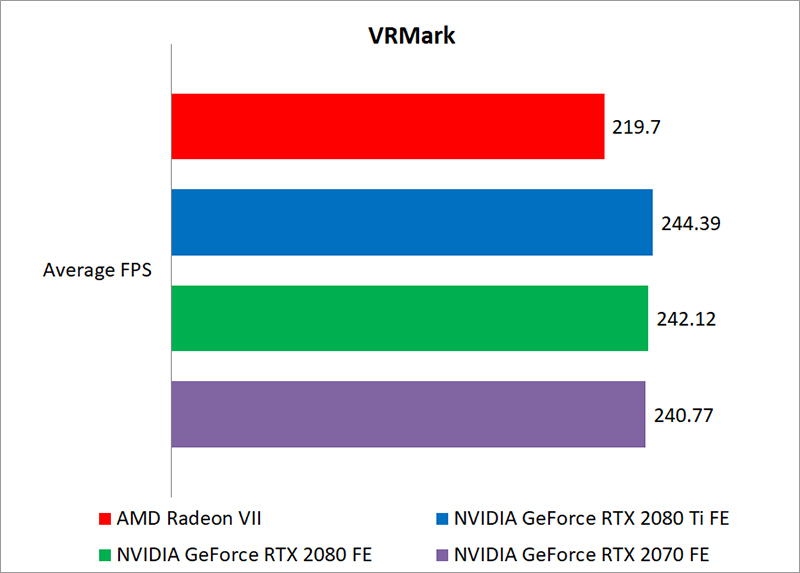 The Radeon VII once again fell between the GeForce RTX 2070 and 2080 here, but the shift to DirectX 12 once again allowed it to show some strong results, where it outstripped even the GeForce RTX 2080 at times. However, I should point out that the NVIDIA cards actually suffer from decreased performance in DirectX 12 mode, so it's a matter of picking the API that suits your card best. And when you do that, it's often the case that the Radeon VII's performance is very similar to that of the GeForce RTX 2080. 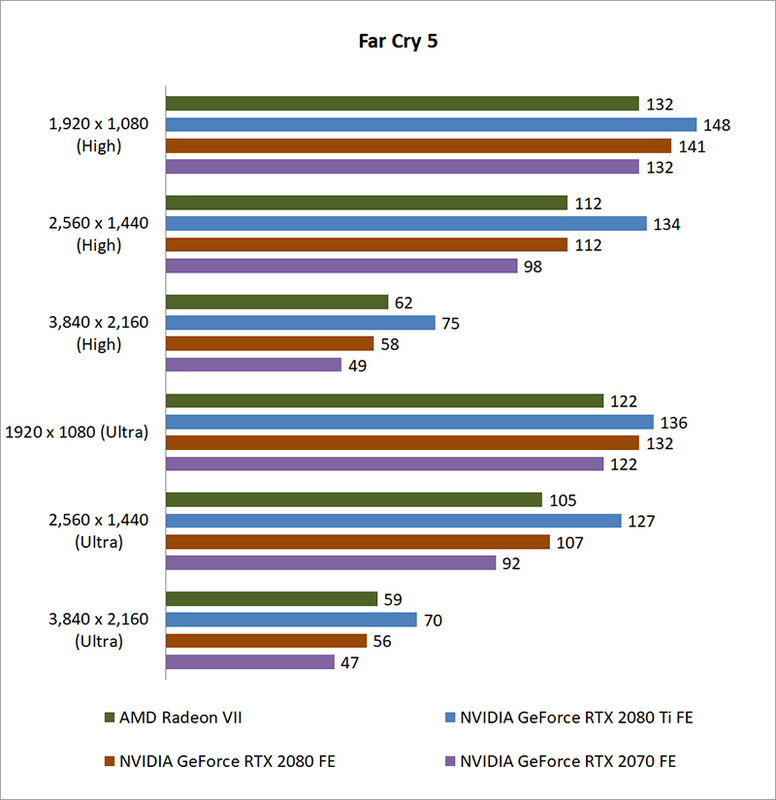 The latest installment in the Far Cry series is actually an AMD launch title, so it'll be interesting to see how the Radeon VII fares here. The Radeon VII did better at higher resolutions here, perhaps owing to its generous 16GB of HBM2 memory and high memory bandwidth. Either way, it was able to match, or sometimes outstrip the GeForce RTX 2080, at 1440p and 4K resolutions. 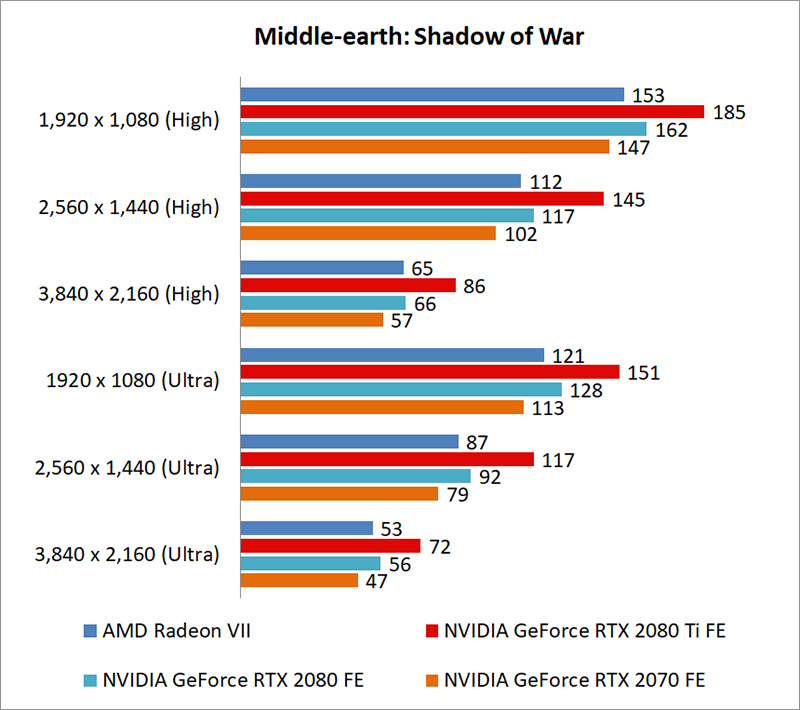 In Shadow of War, the Radeon VII once again turned out numbers between the GeForce RTX 2070 and 2080. However, while it did close the gap with the latter at higher resolutions, it wasn't quite able to outperform it this time. Still, it does come really close to the GeForce RTX 2080. At a 4K resolution and High settings, it was also roughly 13 per cent quicker than the GeForce RTX 2070. 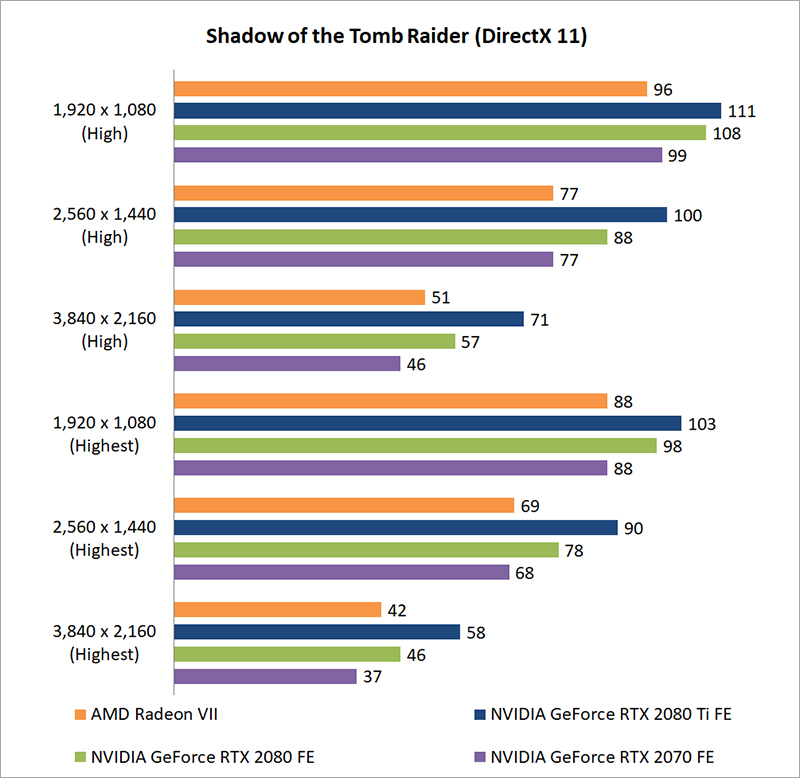 The same pattern repeats itself in Shadow of the Tomb Raider, with the Radeon VII doing a lot better against the Turing cards at a higher resolution. It's clear that the Radeon VII is its weakest at 1080p, where it even falls behind the GeForce RTX 2070 at times. Results like these are often attributed to a card's frame buffer size and in the case of the Radeon VII and its doubled video memory, this holds true where the performance drop off at each resolution step is less impacted than its competitor.